The European Shag is the smallest of the two cormorant species in Norway. In spring, it has a characteristic crest on the head (see picture). You can see them at Lista sitting on the rocks along the beach or flying in big flocks on the sea when they are migrating. In spring they fly across the Lista lighthouse towards NW, having the migration peak in the end of March (see Figure 1). Shags can be distinguished here from the Cormorants because they fly in flock very low above the sea. If you see a bird from the cormorant family flying over the lighthouse or in the freshwater, it is probably a Great Cormorant and not a Shag. 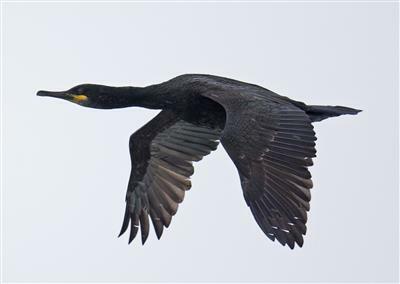 Lista Bird Observatory's data shows that the number of Shags has been above average every year since 2011 and the abundance has been high in 2017. This species shows a significant increase on the long-term trends at Lista, both spring and autumn. This species is one of the seabirds that has managed well along the coast at Lista, and in recent years it has established a relatively large colony on Rauna.